The IP address is a basic attribute related to computer systems that rely on the TCP/IP protocol stack to establish network connectivity. As a result, the vast majority of access control rules deployed on Stateful Firewalls are based upon parameters present, for instance, in the IP,TCP,UDP and HTTP headers. Although this protocol-based approach has demonstrated to be powerful, the need for networks that are flexible enough to accommodate multiple classes of users (employees, contractors, guests) along with the increasing need for network mobility, has motivated the search for alternative ways of implementing access control. This article briefly examines the creation of firewall rules that include some sort of Identity-based information for the users initiating connection requests. As we will see later, in some scenarios identity information may also be associated with the servers. The first generation is centered on the captive portal paradigm, mainly relying on downloadable ACLs to differentiate among users that are connecting through the firewall. The second, normally referred to as the ID Firewall, allows the creation of permissions based on MS AD user/group domain information. The third generation, known as the SGT Firewall, represents a true evolution because it provides integration not only between the firewall with the edge devices (such as wireless APs and LAN switches), which are the main source of user information, but also between the firewall with the switches that reside on the server side (as shown in the figure below). To read the complete article, follow the link to the Cisco Support Community. NAT is not mandatory anymore (as opposed to the nat-control model). NAT table is organized in 03 distinct sections: one for auto-NAT and two for manual NAT (or twice NAT). Translation rules that involve source and destination simultaneously are now defined in a single nat statement (using a manual NAT rule). These are the cases of Dual NAT and all the variants of Policy NAT. Starting on version 8.3, the Access Control Entries (ACEs) refer to the Real IP Address of the host and not to the translated address. By default, manual NAT rules are created within section 1. If you want to insert a nat statement into section 3 you will need to use the after-auto parameter. The sections in the NAT table are processed in order. By reviewing previous posts on the NAT Series, can you build the translation rules that originated the table shown in the figure ? Continuing our series of articles about Network Address Translation (NAT) on Cisco ASA, we will now examine the behavior of Identity NAT. When the nat-control model is in place (for ASA releases older than 8.3), an explicit answer regarding NAT must be provided to the ASA algorithm, even if this answer is do not translate ( “no nat“). Among the NAT exemption techniques supported by ASA, there is one called Identity NAT, which is typically used when most of the addresses are being translated and you need to avoid translation for just a specific set of hosts. Starting on 8.3 version, there is no such concept of nat-control, meaning that NAT Exemption is not necessary anymore and the nat 0 (nat zero) configurations are completely banned. The nat zero construction that refers directly to the IP address (instead of an ACL) is unidirectional in essence and is not suited for address publishing. This means that the 10.10.10.128/26 stations will be able to start outbound connections but will not be accessible from the out interface (even if you configure a permission within an ACL). Identity Static (static from X to X) is bidirectional and, as such, may be used for address publishing. (You will still need to add a permission so that the real address can be reached from the out interface). The NAT flags are distinct: both options have the identity flag set but nat zero is deemed dynamic. (And that reinforces its unidirectional nature). Considering that we are dealing with a source-only translation rule, we employed Object NAT for the 8.3 case. By revisiting the previous posts on the NAT series, can you build an equivalent configuration with Manual NAT ? The show commands registered in the figure help characterize that NAT exemption is in place. Can you explain that ? As explained in a series of previous posts, it is indispensable to understand the NAT philosophy change introduced by ASA 8.3 in order to profit from the new features (available in 8.3 and higher). While the other articles focused on explaining the correspondence between the pre and post 8.3 models, the current one will demonstrate the automatic migration script in action when you upgrade ASA software on a 8.2 box that already contains NAT rules. The dmz client 10.10.10.150 is mapped to 172.18.18.150 when the destination is 172.16.16.200. For other out destinations, the same dmz client is statically translated to 172.16.16.150. If you carefully look at the figure, you will notice that the IP addresses used in the ACL and static rules of the 8.2-style configuration are converted to network objects, which are later employed within the nat statements that characterize 8.3. Although the migration script may be helpful for simple topologies that contains few categories of NAT, it is really critical that you understand how to manually convert from the original model to the new one. There are situations, such as those registered in Figure 2, in which the script may not work. So do not rely blindly on it. I think it is really advisable to invest some time on getting familiar with building the manual correspondence. If you plan to use the automatic migration script, it is really recommended that you remove the nat-control command from your pre-8.3 configuration. This will avoid the creation of many network objects during the conversion process. From 7.0 to 8.2 the default ASA operation mode is to consider NAT an optional feature. This is accomplished with the no nat-control command, which is not displayed in the show running-config listing. If you want to make sure that no nat-control is in place, issue the show running-config all nat-control command. 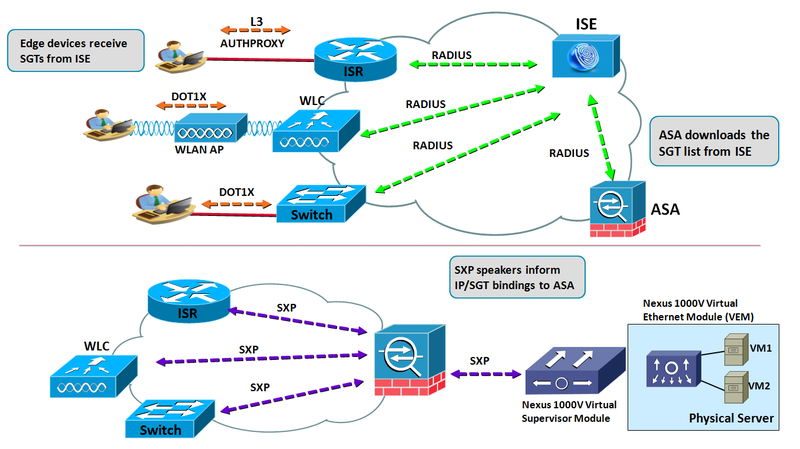 As a follow on to our analysis of ASA NAT, the current post examines another important use case scenario: how to simultaneously translate source and destination addresses on a certain connection through your firewall ? As usual, both the pre-8.3 and post-8.3 configurations are covered so that you can use them to help on your migration tasks (in case your are still using 8.2 or earlier releases). One remarkable difference between the old and new syntaxes resides in the fact that from 8.3 on you just need a single nat statement to produce the dual NAT effect. This is an improvement with reference to the classic model, which required two rules (for instance two static commands) to achieve the same result. When using manual NAT, the use of the sequence number (SEQ#) parameter enables the precise control of the order in which translation rules are inserted in the Unified NAT Table. This renders NAT processing much more predictable than the original implementation. The capability of specifying source and destination mappings at once, makes ASA NAT logic more similar to other vendors’, thus facilitating migration from competitive offerings. By combining the knowledge acquired in the current example with previous articles, can you devise a way of performing Dynamic PAT in the outbound direction and static NAT for inbound ? Specifically, suppose that stations on the 10.10.10.64/26 subnet should be port address translated to 172.16.16.126 when connecting to the outside world, whereas the host 172.16.16.254 should be accessible to dmz hosts as 10.10.10.254. It is very important that you get familiar with the order in which the real and mapped addresses are defined in the nat and static commands. Remember that starting on 8.3, ASA ACLs refer to the real IP of the destination host (as opposed to 8.2 and older versions, which use the translated IP). The ability to use global ACLs, introduced by version 8.3, is another factor that may decrease the efforts when migrating from other vendors’ firewalls to ASA. If you need a detailed coverage of the NAT precedence rules (very important on pre-8.3), please refer to Chapter 08 of the Cisco Firewalls title on the Cisco Press security collection. For information about 8.3 NAT, consult the Appendix, NAT and ACL changes in ASA 8.3, of the same book. This post builds upon the previous discussions on the ASA NAT series to exemplify yet another category of address translation: Dynamic Policy PAT. In this type of scenario, a set of source addresses get mapped into a single global address when they need to reach specific destinations. It is important to observe that we are not translating the destination address. We are just using the destination criteria to influence translation of the source addresses. In the pre-8.3 CLI the number “1” is the NAT_ID, which creates the relationship between the nat and global commands. The original syntax (pre-8.3) employs an Access Control List (ACL) in conjunction with the nat command to insert the destination-based rule. In the new model introduced by release 8.3, we use manual NAT to create any rules that concurrently involve source and destination. This is the case for Policy NAT, Policy PAT and Dual NAT. Unless you use the after-auto argument in the nat command, manual translations are inserted in Section 1 of the Unified NAT Table. As in the basic PAT case (which does not take destination addresses into account), ASA combines the global address (172. 16.16.125 in this case) with a source port to correctly identify each internal host and deliver the return packets accordingly. Manual NAT allows you to add a sequence number to each manual nat statement, so that you can directly control the order of processing of the translation rules (irrespectively of the NAT category in place). This is a major difference when comparing to releases up to 8.2, for which you needed to know the intrinsic NAT precedence rules. It is highly recommended that you get familiar with the “show running nat”, “show running object” and “show nat interface” commands.